Overlooking the arena floor an adjacent to the Arena Club Restaurant, the Ledge Lounge is located on the Club Level between sections 226-228 at the south end of PNC Arena. The Ledge Lounge is a great place before, during or after the game or event. You won’t miss a moment of the action with three 45" flat screen TVs centered in the middle of a spacious (140 linear foot) full service bar, while offering a spectacular view of the event. During Carolina Hurricanes and NC State Men's Basketball games, Ledge Lounge ticket holders receive a carvery sandwich and two beverage vouchers that may be redeemed for soft drinks, bottled beer, small draft beer or house wine (no refills). Visit our Food & Beverage page for more on the Ledge Lounge. Located on the 2nd level (Club Level) of PNC Arena, Club Seat Holders enjoy amenities including in-seat service, comfortable seating, and access to the Buffalo Brothers Zone, the Arena Club Restaurant, and the Ledge Lounge. During Carolina Hurricanes games and select events, in-seat food and beverage service is available to guests seated in Club Level seats. A MENU is placed in your seat upon arrival. For games, in-seat service is available until 10 minutes remain on the clock during the last period. Located along the first and second rows behind the glass, as well as the center three sections at the red line of the rink, On-Ice and Center-Ice Premier ticket holders have the chance to experience the thrill of the game at the heart of the arena bowl. With access to our Club Level concourse, the Arena Club, Ledge Lounge and the Buffalo Brothers Zone, these Premium clients are able to view the game from every angle! 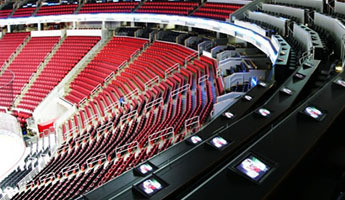 On Ice and Center Ice Premier seats are available for all Carolina Hurricanes games. For Carolina Hurricanes ticket information, call 1-800-NHL-CANES or email. For NC State Wolfpack ticket information, call 919-865-1510 or visit www.gopack.com.